Are skilled specific day classes that are 30 minutes long each. You choose the skill you want to improve in. Tumble: Cartwheels, Back handsprings, Back Tucks, Front Tumble & Fulls. Standing and running tumbling. Clinic schedules change monthly and will be updated online. Check this site or refer to our monthly newsletter for up-to-date clinic information. All clinics will be 30 minutes. Must enroll in advance to prevent clinic cancellation. No refunds if a customer cancels in less than 24 hours or does not show up for their clinic. The Excite! waiver and policy agreements are required from each child and adult. Drop-in clinic! No sign up necessary. The Excite! waiver and policy agreements are required for each child and/or adult. Floor time, no spotting available. This clinic runs Tuesdays & Thursdays from 8:15-9:15pm. $2 per person (waiver required). Tumble, Stunting & Motions Great for LFA, FMYA, LFYA etc. 30 min ($30, up to 6 cheerleaders, $5 each additional) $30 cost still applies if less than 6 girls. 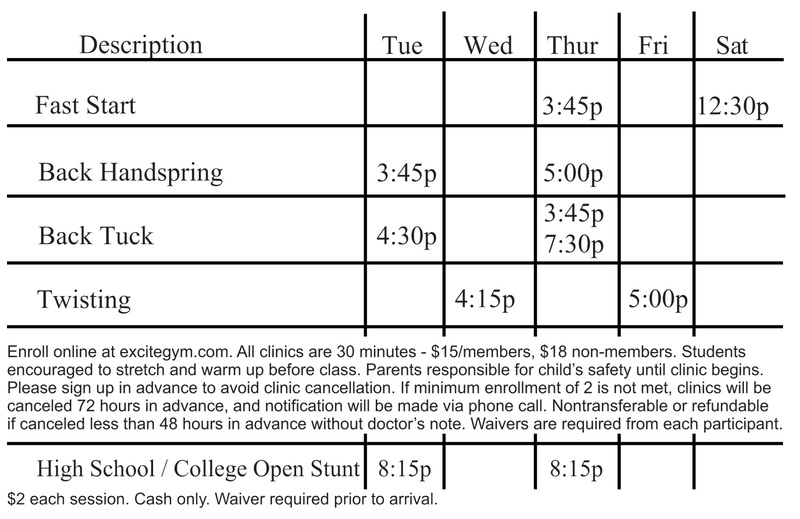 Call 972-874-8500 or email office@excitegym.com to schedule. Must pay when scheduling. Person scheduling must pay for the entire group. No refunds for individuals or groups that are prepaid for and no-show. The Excite! waiver and policy agreements are required for each child and adult.